Uprooting the entire tax law would inflict massive tax increases on nearly every American family. Approximately nine-in-ten taxpayers are experiencing a reduction in their tax burden thanks to the new policy, on which every last Democrat in Congress voted 'no.' Republicans' parallel programs of de-regulation and tax relief have helped fuel and sustain a sizzling US economy, the positive effects of which are simply undeniable. Voters, who are quite wary of President Trump overall, recognize this, and have rewarded him with much stronger marks on taxes and the economy than on other fronts. Public support for tax reform has flipped from badly upside-down to right-side-up, as Democratic myths and demagoguery have been disproven in real time by people's lived reality -- even as people like Pelosi sneer at the progress. Talking about undoing tax reform means that Democrats are willing to hammer families, individuals and small businesses with tax increases, including the overwhelming majority of middle income households. Liberals would likely focus the rhetoric justifying their clawback by targeting that evil corporate tax cut, which is a big element of why the economy has taken off. It's why hiring is up, and why hundreds of companies have shared their tax windfalls with millions of their employees through bonuses and other enhanced benefits. It's why tens of millions of Americans are seeing utility bills slashed. And it's why small business owners are feeling as optimistic as ever about the prospects for their businesses. 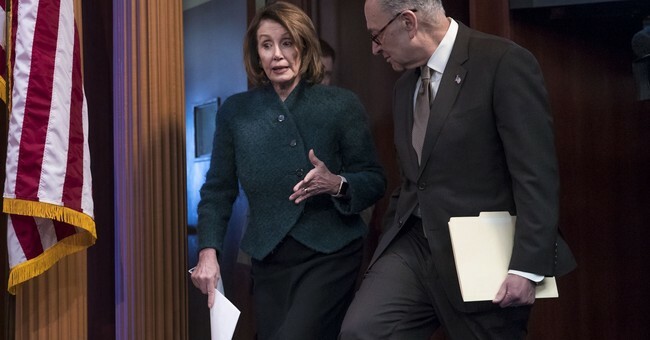 Are Nancy Pelosi and friends intent on erasing these gains? Two more points: First, while demagoguing corporate tax cuts will be an easier political sell for Democrats, it's important to remember not only that those reductions are a key driver of the robust economic climate, but also that the new corporate rates are a sorely-needed correction to a previous status quo that put American companies at a distinct competitive disadvantage. Prior to reform, US corporates rate -- both statutory and effective -- were among the very highest in the developed world. The Republican law brings the United States roughly into the middle of the pack on these measures, a major improvement. The problem was so glaring that even President Obama proposed slashing corporate taxes during his term in office. The GOP finally delivered results on that front, providing pro-competitiveness parity and sorely-needed certainty to job creators. Threatening to scramble the rules again would threaten to undermine the important economic gains achieved under the new law. And second, to Pelosi's claim that the reform plan was rammed through at "the speed of light," the truth is that it was passed under a process at least somewhat resembling regular order. It entailed committee hearings, amendments and votes in each house, full debate on both floors, and a bicameral conference committee to iron out differences between the two chambers' legislative text. It took months of work, and years of groundwork. Oh, and the notion that Nancy Pelosi -- a top Obama ally -- is worried about deficits is laughable on its face. Her position is that the government virtually always spends too little.